I always wanted to say that. With today's prompt I get the chance. It's the only camel joke I know. I sat on a camel once. It was Tel Aviv in the mid 80s. I was a parliamentary journalist at the time and somehow got myself invited along with a bunch of travel writers on a whirlwind tour or Israel. Marvellous country. I got to float in the Dead Sea, melt in the heat of Masada, visit the birthplace of Christ, walk the way of the cross and, best of all, sit on a camel. The camels were there largely for a photo op. "Get your picture on a camel." And I got some great pictures, although I have no idea where they are these days. I had a cheap little Kodak instamatic camera, as I recall. A point and shoot. No zoom. So I had to get in close to get a good picture of this camel. But this camel didn't like me getting in close and let me know it. In the blink of an eye my eye was covered in camel spit. Yep, this dromedary drooled all over my face. It was a popular phrase at the time but I found no comfort in it. 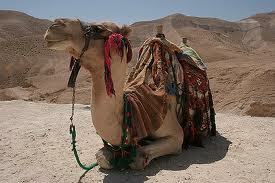 After how that ungulate ingrate treated me, I wouldn't walk a mile for a camel. Now hump on over to We Work For Cheese and see if the other participants in this writing challenge walked a mile for a camel. Ewwww! I'm just glad you didn't need an eye transplant or something. Ewwww! And thanks for making me look up the words dromedary and ungulate. I could tell what they meant from the context, but you got me curious. Alex rode camels in Saudi Arabia. I would be afraid to get too close to one. They do spit to show their displeasure and I might too if I lived in Saudi Arabia. Yuck! Being spit on by a camel would turn me off of them for life! I guess that particular camel didn't want you as a BFF. I actually googled camels this morning for inspiration for my graphic over at WWFC and was surprised at all the rather dirty jokes about camels. When you referred to a camel joke I was a bit worried. You WIN. You actually were spit on by a camel. YOU WIN! Shoulda kicked the camel in the junk. Bring him to his knees! I always wanted to go to Israel. It's on my bucket list. Camel spit has gotta be a combination of sand and fatty hump deposits. Must take weeks to remove. Oh man, I've always wanted to travel to Tel Aviv! Color me jealous! Israel is an amazing country. I'll remember that trip forever. Oh, it's bad. I mean awful. Well actually he was already on his knees, so it was kinda hard to get at his junk. Wahoo, what do I win? Yeah this was an entirely different kind of camel, A real one. Nicky, I'm sorry. I couldn't link all week because I was off fishing. Just got home Sunday night. I had post-dated my posts so they'd appear automatically. You see the lengths I go to to stay in this gosh-darn writing thingy. Yeah, I haven't come across one since. I'd never been that close to a camel before. And I haven't been since. Ha, ha, I love alliteration. I go looking for synonyms just for fun!